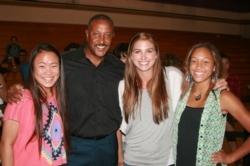 London Olympic gold medalist Alex Morgan made a surprise visit to her alma mater Diamond Bar High School on August 27. “Alex was nice enough to surprise our students with a visit during lunch. We packed the gym with eager students wanting to pay their respects to Alex and they were not disappointed, said Athletic Director Kurt Davies. Then the hometown girl was surprised when school administrators announced that they were retiring her number. “We presented Alex with a banner commemorating her gold medal achievement and instead of retiring her number - the captain of the Brahma Girls’ Soccer team will forever wear #13 and the number will always be gold,” Davies said. Alex was really moved by the gesture and it was a great moment for everyone in attendance, he said. Perhaps the highlight was when Alex led the crowd in the “Brahma Spell-out”. “We are so incredibly proud of Alex. Not only is she is an amazing athlete, but she is such an incredibly kind and humble human being. She definitely represents Diamond Bar athletics: Purple pride, gold standard. We are so grateful that she took the time to do something special for the students and staff!” said Principal Catherine Real. Following the ceremony, the 2007 grad was gracious enough to sign autographs and take pictures with hundreds of students. 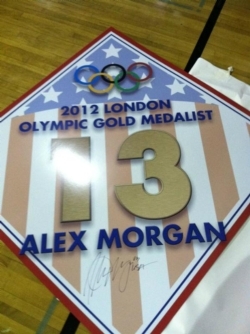 (1) Diamond Bar High graduate and Olympic gold medalist Alex Morgan signed jerseys. (2) Principal Catherine Real and Athletic Director show the gift prepared for hometown hero Alex Morgan before her surprise visit with students. 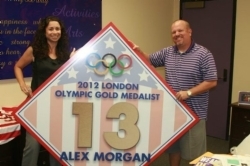 (3) Olympian Alex Morgan was presented with a commemorative banner to celebrate her golden achievement. (4) Varsity Pep Squad members Victoria Yim and Candace Rucker with Olympian Alex Morgan and Magnificent 7 President Clark Rucker.